People who know me well can tell you that I have a thing for bags. I have owned and swapped out a variety of bags over the last 20+ years of working in and around schools. First, let me say that some bags are great for certain uses, while others have the ability to perform multiple duties. For me, the search for the perfect, elusive everyday bag has been an ongoing process. For the past four years I have used a messenger style bag from Filson. Filson is an American made brand headquartered in Seattle, Washington, and they specialize in using fabrics like Tin Cloth and twill. My Filson 24-Hour Briefcase is a bag I still own and treasure as it has traveled around the world, and been a steady and true work companion. In recent months, I have been looking to move towards a backpack style bag as I find it easier on my back and shoulders. So, I set out to find a new bag during the holiday break that I could use both as an everyday bag around campus but could also transition into a travel bag without any effort. 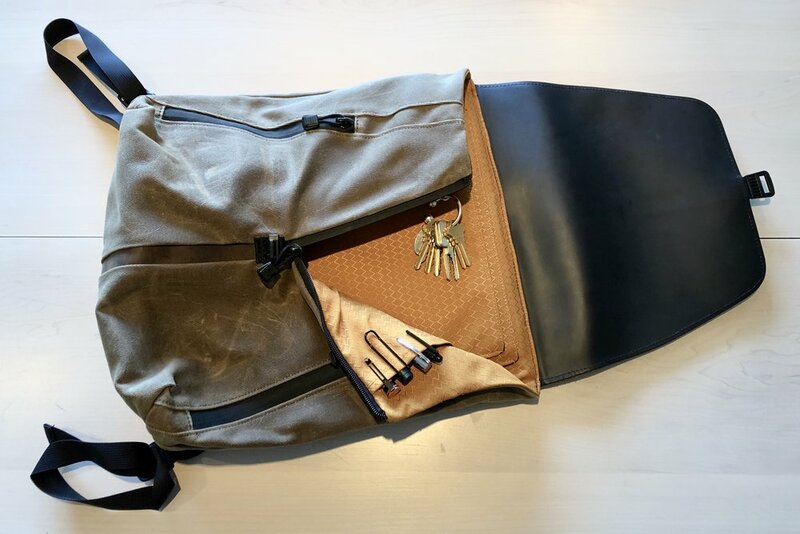 Enter the Staad Backpack from Waterfield Designs based out of San Francisco, CA. I first came across Waterfield bags in 2003 when I purchased one of their early briefcase/messenger bags. They are handmade using quality materials and are built to last. Onto why the Staad backpack one the contest for my next everyday carry bag. The Staad is made of quality materials, a gorgeous leather flap, waxed canvas body and comes in two sizes, slim and stout. The stout version is pictured below and still has a small profile with plenty of room for my every day carry (EDC). Waterfield bags are always pushing the design envelope, and one of the features I love about this bag is the vintage WWII-era buckle that is super easy to use and unlatch. It has two exterior pockets and a zipper on the inside that comes about 3/4 of the way down so that the contents don’t all come spilling out. In addition, the inside of bag has two sleeve compartments, one for a laptop and one for a tablet. I use the larger sleeve for my iPad Pro 10.5, and the smaller sleeve to hold my document holder and large Moleskine notebook. My keys connect to the key latch and there are two Velcro pockets that hold pens, eyeglass cases, and the like. I also carry three separate smaller pouches each with a specific set of contents. 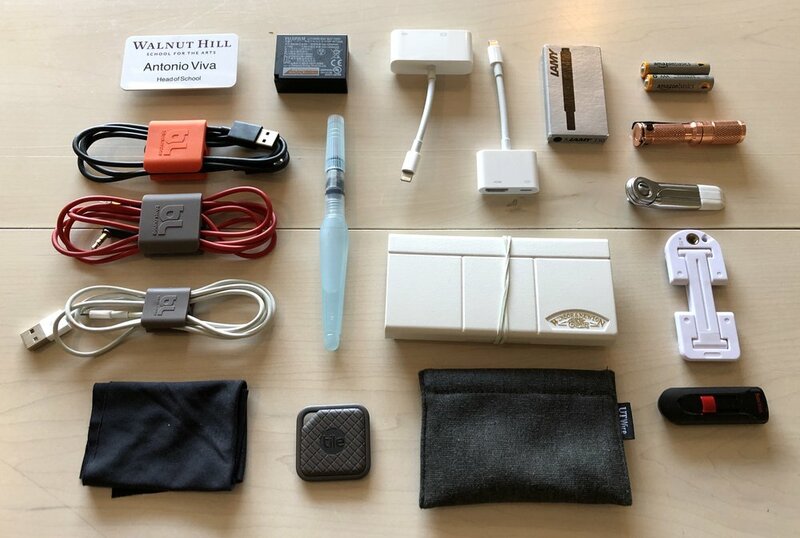 I find that this keeps the inside of my bag clean and organized and I can easily access various things without having to rummage through everything to find what I am looking for. The large black mesh pouch is where I store all my cables, dongles, and spare camera battery. I also carry a small set of Winsor & Newton watercolors along with a watercolor brush, spare Lamy black ink for my fountain pens, and Maratec Nichia 219 copper AAA flashlight, which I love. It is the brightest and most compact flashlight I have ever used. It comes in handy when you are looking for stuff through your bag on long haul international flights or to have by your hotel bedside table. The flashlight is also super handy when you are looking through the bag in a dark room, conference, or at night in a cab. I also always have with me some spare batteries and a Joby iPhone tripod stand and mount, which I use to watch movies during a flight. Cables, dongles, batteries, etc. are stored in the large black mesh pocket. The leather roll contains various pens, pencils, markers and a highlighter. I also carry a small ruler around, which comes in handy when you want to measure something or need a straight drawing edge. I started using fountain pens exclusively about 7 or 8 years ago and it has been, without question, one of the best decisions I’ve made. Fountain pens give you immediate feedback from how quickly the ink flows to the way the ink interacts with paper. I carry three with me at all times: two Faber-Cassell Ambition pens, one fine and one medium nib, a Lamy Safari Petrol Special Edition, and of course a black Sharpie. I have traveled with fountain pens around the world and on countless flights, and I have never once had an issue with pens or ink leaking. If you own a fountain and don’t travel with it you are missing out. If you don’t own a fountain pen, you can pick one up for less than $20. Stanley Tools and Wild and Wolf collaborated to make a set of great canvas zipper pouches and I use this small one as my CVS on-the-go bag. It contains tea, instant organic coffee, a packet of Emergen-C, some goodwipes, Visine, Hands of Hope chapstick, and hand cream. I also carry a small Muji container with spare hearing aid supplies. This pouch is often being refilled as it gives me any essentials I need while I am on the road. This summer I upgraded to the new iPad Pro 10.5 inch and made a commitment to use it as my primary machine when I am not at the office. My MacBook Pro 13 inch is a great machine and it sits on my desk more often since getting this new tablet. With iOS 11 installed and built in LTE service I have everything I need to import photos, edit, post, answer email, access files and documents and conduct the work of school when I am not physically on campus. In addition to my iPad Pro I have simplified my camera equipment to a single body and lens combination. The Fuji XT-2 with the 16-55mm f2.8 lens has been a great and easy way to minimize how much gear I carry with me. Some photographers feel the lens is bulky and heavy, but it stays on the camera non-stop and gives me a pro-level equivalent of a 24-70mm focal range and constant f2.8 aperture and, together with the XT-2 body, the entire kit is weather sealed. I added a leather half case to the camera to provide better grip and to balance the size of the lens. The wireless connectivity between my camera and the iPads make importing photos fast and easy. Photoshop Express makes editing files and putting together grids a breeze. The only other photo-related tool I bring with me on the road is an inexpensive LensPen that has a brush on one end and a microfiber cleaning tip on the other. For writing, note taking, and document storage I use a combination of tools that are wonderfully analog. I use a Monocle Accordian Document Holder, which is a slim and easy way to organize and keep track of receipts, currency, my passport, stamps, and my checkbook. I keep physical photos of my family with me in it, and it’s also a great place to store instant photos. Also, I have both a large and small Moleskine notebook. The smaller one fits easily in my pocket or blazer and gives me easy access to a paper notebook for ideas and my to-do list. The larger notebook serves as my primary note taking tool. Lastly, I always travel with a pair of reading glasses and aviators. In addition, the two outside zipper pockets contain my business card holder, a Gerber Clutch multi-tool, a Victorinox Army knife, some Advil, and my charger. These outside pockets are not that large or deep but they are perfect for items you want to get to easily without having to open the bag up. Outside pockets hold business cards, tools, a charger and Advil. As a Head of School, photographer, and writer, I have come to appreciate that less is more. Having the right tools to be able to do one’s work as well as manage the challenges of travel, both domestic and international, requires a focus on quality tools and a minimal approach. This everyday carry achieves that and more, and it goes with me regardless of whether I am walking across campus for a day in the office or headed on a flight to the west coast to visit with alumni. For longer trips (and not included here) I add two additional pieces: a Mophie XXL Portable powerbank and a Swell Aluminum Water bottle. I hope you enjoyed getting an inside look.